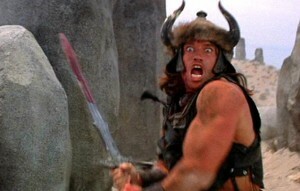 The film score for Conan the Barbarian by Basil Poledouris, as everyone knows, is one of the best things ever in the history of Earth. Apparently, Basil himself did not think so. Juicy rumors are circulating on the internet that he was unhappy with the orchestra in Rome during the original 1981 recording sessions. Who knows. However, the score has been re-recorded in an attempt to recreate the composer’s original vision for his masterpiece of Leitmotifs. My Dad, a huge fan of everything Conan, received the album for Christmas. While the recording of the immensely talented Prague Philharmonic orchestra is doubtlessly superior, I have so long loved the original that my ears were not receptive to any deviation from the sound that my brain had mapped note for note. Also, there’s something scrappy and unaffected about the original that is pure magic. (You can hear one of the trumpet players totally mess up in the climax of “Anvil of Crom” and it only makes it more alive.) Listen and decide for yourself after the jump. The 2010 album is available here or here and includes a lovely intro written by Zoe and Alexis Poledouris as well as previously unrecorded compositions. Also after the jump is a picture of Sandahl Bergman because she is awesome.